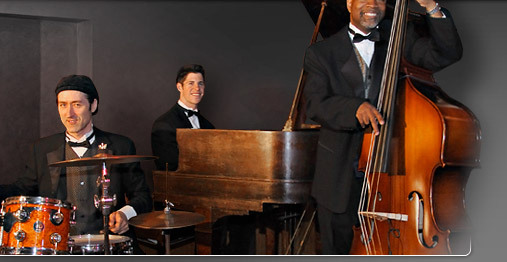 The jazz trio is a popular option for setting an elegant mood for a variety of special events. Whether performing in a jazz club, a reception event where guests are socializing, or a concert hall, our versatile jazz musicians always cater to the dynamics of the event  but we also strive to convey a special ambiance with our artistry  our extensive song list and creative arrangements are constantly growing. We typically open our set with upbeat, sophisticated, soulful jazz standards, and mix in latin and pop arrangements for variety, with the right balance between fast and slow arrangements, as well as latin styles  if appropriate, we also like to perform contemporary/ pop funky jazz arrangements, typically in the last set. Our jazz musicians are established, reliable pros you can trust for your event. includes piano, upright acoustic bass (also a visual treat) and drums. The trio performs a variety of tasteful, elegant jazz standards by such composers as Miles Davis, G. Gershwin, D. Ellington, D. Brubeck, to name a few, standard songs made famous by artists such as Frank Sinatra, polished latin arrangements, including The Girl From Ipanema and One Note Samba, as well as optional contemporary arrangements such as Sting, Marvin Gaye, and George Benson selections. Our Chicago Jazz Trio has performed for hundreds of special events at Navy Pier and across Chicago land, we can be seen regularly in clubs such as the Green Dolphin Street, as well as The Chicago Cultural Center. View our jazz trio song list here.